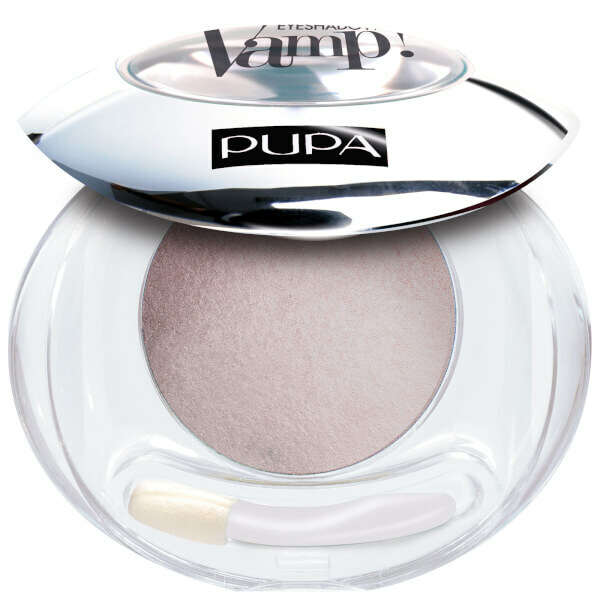 Enhance your eyes with the PUPA Vamp! Wet and Dry Eyeshadow; a double-use, baked powder shadow that is able to create multiple, effective makeup looks. Applied dry, the eyeshadow delivers a veil of luminous colour that illuminates the eye area and when used wet, the powder provides a more intense and vibrant colour. Arriving in an array of dreamy hues, each shade boasts a satin or pearl finish that captures the light and offers unique radiance. The eyeshadow is presented in a sleek compact with a convenient foam applicator. Free from Parabens. Ophthamologist tested. Pick up a small quantity of product using the applicator, blend off the excess powder on the back of your hand and then apply by tapping on your eyelid. Use it with the dry applicator to enhance the eyelids with a luminous colour, and with the wet applicator, for an intense and vibrant colour. Use the darker colours either on the tail of your eye or on all the upper and lower eyelids for a smoky effect, the lighter colours on the light spots – below the eyebrow arch angle, next to the tear duct or at the centre of the eyelid – and the bright colours either on all the eyelid or just at the centre, for a precious touch.